This is one of my favorite pictures of my daughter Maggie. She's not usually this sweet ;-) but at least a few times a day we get a few moments when she's active, smiley and interactive. 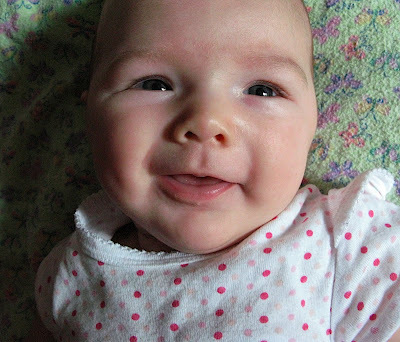 I took this picture last weekend, so she's about nine weeks old here. A lot of Maggie pictures tend to really distort her, and while often cute they don't all equally capture that part of her that really defines her personality (in my eyes). The grin here is very recognizable and actually looks a lot like her cousin Josh. I rarely get any sense of what she will eventually look like, but I can see this smile lasting a few years at least.